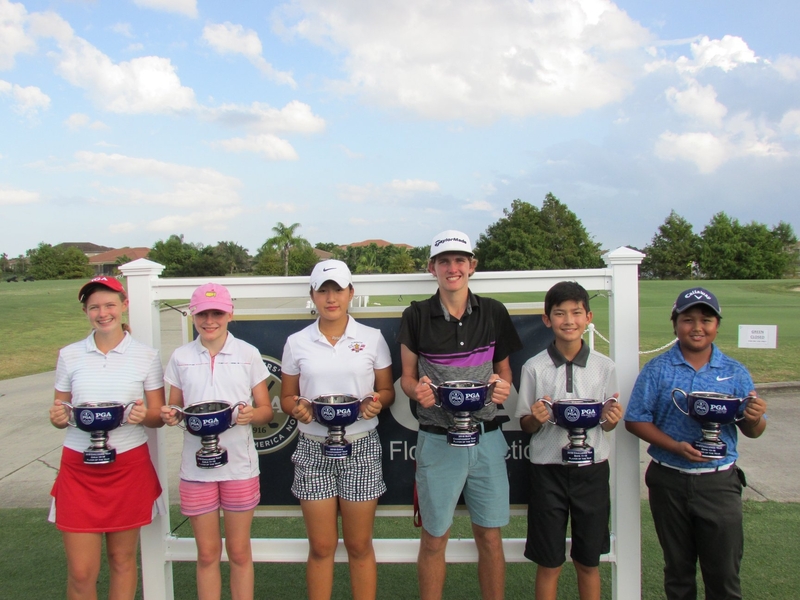 December 12th 2018 - ATLANTIS, Fla. – The South Florida PGA Junior Tour named six Player of The Year winners last week. The South Florida PGA annually awards Player of the Year honors to one boy and girl in the Challenge Tour 11-12 age division, one boy and girl in the Challenge Tour 13-18 age division and one boy and girl in the Championship Tour division. This year we had a few very close races that came down to the very last event. Palm City native Garrett Giles has been named the 2018 Championship Tour Player of the Year. Giles had an outstanding season finishing first in 3 tournaments. Two out of these three tournaments were Major Championships consisting of some of the best players in South Florida. In addition to these three incredible wins, Giles rounded out the year with a 73.4 scoring average and finished in the top 10 in 7 tournaments. Skylee Shin of Doral has been named the 2018 Championship Tour girls Player of the Year for the second year in a row! Shin was named the Challenge Tour girls Player of the year in 2016 and followed it up with two dominating seasons on the Championship Tour. The 14 year old captured 3 victories, 3 runner up finishes, and finished top five in 11 out of 12 events! Shin continues to excel and improve her game every tournament, she will be one to watch for in years to come. Kelly Shanahan of Coral Springs, FL was awarded the 2018 Challenge Tour Player of the Year honors. Shanahan put together an incredible season winning 4 of her 8 events, finishing top 5 in all but 1 tournament. At only 14 years old, Shanahan will be fun to watch compete on the Championship Tour in 2019 and the following years. NaShawn Tyson of North Palm Beach, FL has earned the 2018 Challenge Tour Player of the Year. Tyson put together an outstanding season with a scoring average of 75. Tyson took home 2 victories throughout the season, and placed top 5 in an additional 3 events. At only 13 years of age, Tyson will be one to watch throughout high school as he moves up to our Championship Tour in 2019. Eric Nguyen of Pembroke Pines, FL has been awarded the 2018 Challenge Tour (Boys 11-12) Player of the year. Nguyen had an impressive season placing top three in 9 of 12 events. At 11 years old Nguyen had an unbelievable scoring average of a 78.8. Sara Davey of Fort Lauderdale, FL has earned the 2018 Challenge Tour (Girls 11-12) Player of the Year. Sara won 2 tournaments throughout the season and finished top 3 in five of her eight events.